Astronomical and geological evidence indicates that the Universe is approximately 13,700 million years old, and our SOLAR SYSTEM is about 4,567 million years old. Earth's Moon formed 4,450 million years ago, just 50 million years after the Earth's formation. Because the composition of the rocks retrieved from the Moon by the Apollo missions is very similar to rocks from the Earth, it is thought that the Moon formed as a result of a collision between the young Earth and a Mars-sized body, sometimes called Theia, which accreted at a Lagrangian point 60° ahead or behind the Earth. A cataclysmic meteorite bombardment (the Late Heavy Bombardment) of the Moon and the Earth 3,900 million years ago is thought to have been caused by impacts of planetesimals which were originally beyond the Earth, but whose orbits were destabilized by the migration of Jupiter and Saturn during the formation of the solar system. The Mars Reconnaissance Orbiter and the Mars Global Surveyor have found evidence that the Borealis basin in the northern hemisphere of Mars may have been created by a colossal impact with an object 2,000 kilometers in diameter at the time of the Late Heavy Bombardment. Approximately 3,000 million years ago, the earth was cool enough for land masses to form. The supercontinent Rodinia was formed about 1100 million years ago, and it broke into several pieces that drifted apart 750 million years ago. Those pieces came back together about 600 million years ago, forming the Pan-African mountains in a new supercontinent called Pannotia. Pannotia started breaking up 550 million years ago to form Laurasia and Gondwana. Laurasia included what are now North America, Europe, Siberia, and Greenland. Gondwana included what is now India, Africa, South America, and Antarctica. Laurasia and Gondwana rejoined approximately 275 million years ago to form the supercontinent of Pangea. The break up of Pangea, which still goes on today, has contributed to the formation of the Atlantic Ocean. The times are approximate and may vary by a few million years. Sun was only 70% as bright as today. - 4500 mya: Formation of the Earth. Moon's orbit is beyond 64,000 km from the Earth. of the Moon to face the Earth permanently. - 4280 mya: Water started condensing in LIQUID form. - 3900 mya: Cataclysmic meteorite bombardment. The Moon is 282,000 km from Earth. 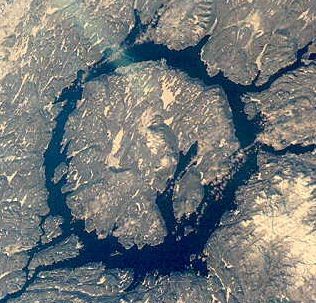 - There is no geologic record for the Hadean Eon. - 4000 mya: The Earth's crust had cooled. - 3500 mya: Monocellular life started (Prokaryotes). - Sun brightens to 80% of current level. - Oldest record of Earth's magnetic field. - Stable continents first appeared. in the oceans and atmosphere. also called the Oxygen Catastrophe. Anaerobic organisms are poisoned by oxygen. capable of aerobic RESPIRATION appear. - 2000 mya: SOLAR luminosity is 85% of current level. - Complex single-celled life appeared. - Abundant bacteria and archaeans. - Oxygen builds up in the atmosphere above 10%. ultraviolet RADIATION from the sun. - 1500 mya: Eukaryotic (nucleated) cells appear. - Green (Chlorobionta) and red (Rhodophyta) algae abound. - 1000 mya: Multicellular organisms appear. - 900 mya: Earth day is 18 hours long. The Moon is 350,000 km from Earth. due to global glaciation ("Snowball Earth" hypothesis). The Moon is 357,000 km from Earth. - 600 mya: Earth day is 20.7 hours long. Jellyfish, Tribrachidium, and Dickinsonia appeared. - Abundance of multicellular life. - 510 mya: Vertebrates appeared in the ocean. SOLAR brightness was 6% less than today. - First green plants and fungi on land. - Fall in atmospheric CARBON dioxide. - 450 mya: Start of Andean-Saharan ice age. - 443 mya: Glaciation of Gondwana. * Mass extinction of many marine invertebrates. Second largest mass extinction event. 49% of genera of fauna disappeared. - 420 mya: End of Andean-Saharan ice age. - Earth day is ~21.8 hours long. - 375 mya: Vertebrates with LEGS , such as Tiktaalik appeared. - 374 mya: * Mass extinction of 70% of marine species. occurring over 20 million years. - 350 mya: Beginning of Karoo ice age. - Forests consist of ferns, club mosses, horsetails, and gymnosperms. - Earth day is ~22.4 hours long. The Moon is 375,000 km from Earth. - 260 mya: End of Karoo ice age. Temperatures reach 50-60°C on land, and 40°C at the sea-surface. - Reptiles populate the land. - Flying reptiles (Pterosaurs) appeared. 3 times stronger than today. and produce great volume of lava and gases. and 85% of land species, including the dinosaurs. - FLOWERING plants become widespread. - Social insects achieve ECOLOGICAL dominance. CO2 concentration was 2000 ppm. Earth day is 24 hours long. The Moon is 378,000 km from Earth. circum-polar ocean circulation builds up Antarctic ice cap. 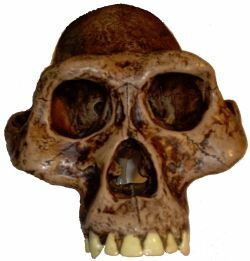 - 4.4 mya: Appearance of Ardipithecus, an early hominin genus. - 4 mya: North and South America join at the Isthmus of Panama. Animals and plants cross the new land bridge. Ocean currents change in the newly isolated Atlantic Ocean. 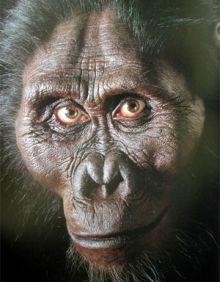 - 3.9 mya: Appearance of Australopithecus, genus of hominids. 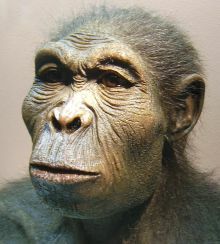 - 3.7 mya: Australopithecus hominids inhabit Eastern and Northern Africa. - 3 mya: Formation of Arctic ice cap. - Climate became cooler and drier. - 2 mya: Tool-making humanoids emerge. Beginning of the Stone Age. - 700,000 yrs ago: Human and Neanderthal lineages start to diverge genetically. and use stone cutting tools. - 160,000 yrs ago: Homo sapiens appeared. Origin of human female lineage. - 125,000 yrs ago: Eemian stage or Riss/Würm interglacial period. Hardwood forests grew above the Arctic Circle. - 105,000 yrs ago: Stone age humans forage for GRASS SEEDS such as sorghum. glaciers cover Canada and northern US. bush fires destroy habitat, and megafauna die off. - 40,000 yrs ago: Cro-Magnon man appeared in Europe. - 28,000 yrs ago: Neanderthals disappear from fossil record. - 20,000 yrs ago: INVENTION of fired ceramic pottery. - 19,000 yrs ago: Antarctic sea ice starts melting. - 11,400 yrs ago: End of Würm/Wisconsin glacial period. Artificial satellite orbits the earth (1957). Humans walk on the surface of the moon (1969). The five major mass extinctions events occurred during the terminal Ordovician (443 mya), Late Devonian (374 mya), terminal Permian called the "Great Dying" (251 mya), terminal Triassic (201), and terminal Cretaceous called the K/T event (65.5 mya). Some scientists have tried to correlate the migration of humans to America with the extinction of the megafauna of the Pleistocene Epoch while others feel that weather changes brought about by the explosion of an asteroid or comet over North America might have been responsible. There is no doubt that human activities can have a substantial impact on the environment and native species. The dodo, a flightless bird indigenous to Mauritius, became extinct in the late 17th century from massive hunting and the introduction of animals such as dogs, pigs, and cats. The Passenger Pigeon went from being the most common bird in North America to extinction by the end of the 19th century due to hunting and loss of habitat by deforestation. Overfishing the costal waters of California in 1945 produced 235,000 tons of fish, but in 1948 only 15,000 tons of fish were caught which led to the collapse of Cannery Row. The Dust Bowl was a man-made ECOLOGICAL disaster caused by deep plowing of the top soil of the Great Plains which destroyed native grasses whose roots had protected the soil from erosion. Drought and wind created a period of severe dust storms between 1930 and 1936. Soils that had been fertile became incapable of growing crops after the top soil was blown away. The contemporary destruction of tropical forests by the logging industry and the large-scale clearing of forests to plant commercial crops is already having harmful ecological effects that are likely to become worse if non-sustainable practices continue to be used. Human industrial activity that relies on burning fossil fuels, such as coal and petroleum products, has been generating the greenhouse gases CARBON dioxide (CO2), methane (CH4), and nitrous oxide (N2O), in large quantities since about 1750. The chart below shows the levels of atmospheric carbon dioxide during the last millennium and its sharp rise during the last century. Atmospheric MODELS predict that elevated greenhouse gases will cause global warming and influence weather patterns that will melt polar ice and destroy the habitat of animals such as the polar bear. The increase of global temperatures will also reduce the amount of snow deposited on mountains thus decreasing the flow of water in rivers which are now used for navigation, irrigation, and as sources of potable water. Carbon dioxide will also increase the acidity of sea water and threaten coral reefs and shell-building oceanic life forms. Today, the concentration of atmospheric carbon dioxide is 380 parts per million (ppm) and the North Pole's mean annual temperature is -20°C. Analysis of core sediments in the Arctic Circle indicate that 55 million years ago, the carbon dioxide concentration was 2,000 ppm and the North Pole's temperature averaged 23°C (73.4°F). SATELLITE IMAGES by NASA show approximately a 20% reduction in the Earth's minimum ice cover between 1979 and 2003. Arctic perennial sea ice has been decreasing at a rate of 9% every ten years. At this rate, the summertime Arctic Ocean will be ice-free before the year 2100. There is a large amount of water stored as ice over the landmasses of Greenland and Antarctica. If the ice sheets melt, the resulting rise in global sea level will flood many coastal areas around the world. The Greenland ice sheet contains enough water to increase the global sea level by 24 feet (7.3 meters), the West Antarctic ice sheet could raise sea level by 19 feet (5.8 meters), and the East Antarctic ice sheet could raise the sea level globally by 170 feet (51.8 meters). The combined effect of melting all the ice on Greenland and Antarctica would result in a sea level rise of 213 feet (65 meters). Using computer MODELS , scientists at the University of Arizona Department of Geosciences have created maps that show areas susceptible to rises in sea level (in red). 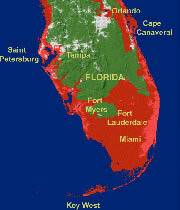 The following map shows that a 6-meter (20-foot) rise would flood Miami, Fort Lauderdale, Tampa, and the entire Florida coastline, as well as parts of Orlando and other inland areas. 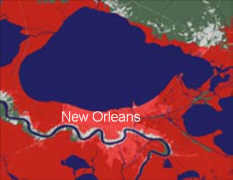 Most of the city of New Orleans, Louisiana will disappear under water if the sea rises six meters. Some scientists have warned that by the year 2200, at the current rate of greenhouse gas emissions from human activities, the atmospheric levels of carbon dioxide, methane, and nitrous oxide will be at the same levels associated with mass-extinction events in the Earth's past. The future of the Earth is linked to the fate of the Sun. The Sun is halfway through its life cycle and will exhaust its supply of hydrogen fuel in around 4,000 million years. As the Sun cools, its core will collapse and its atmosphere will expand transforming the Sun into a red giant star. The swelling Sun will engulf the planets closest to it, and the Earth will be completely vaporized. The Sun will die in several stages. When its core crashes inwards, it will start fusing helium atoms into carbon. When the helium supply runs out, the center will collapse again and form a white dwarf star that will become dimmer until its light finally fades. The final collapse of stars which are a few times larger than the Sun ends in a massive supernova explosion that leaves behind a rapidly SPINNING neutron star. Long before the Sun becomes a white dwarf, 2,000 million years from now, our Milky Way Galaxy is predicted to collide with the Andromeda Galaxy. The collision will take place for several million years and result in one combined super galaxy named Milkomeda. The sun may become part of the Andromeda system during the collision and could eventually end up far away from the new merged galactic center. The Earth may also eventually lose its Moon. Scientists using the laser ranging retroreflector positioned on the Moon in 1969 by the Apollo 11 astronauts have determined that the Moon is receding from Earth at a rate of about 3.8 centimeters per year. +1500 my: Sun is about 6000 million years old and 15% brighter than today. +2000 my: Milky Way Galaxy starts colliding with Andromeda Galaxy. +3000 my: SOLAR SYSTEM becomes part of the new Milkomeda Galaxy. +4000 my: Sun is about twice as bright as today and its radius is 40% greater. Sun starts to exhaust its supply of hydrogen. +5000 my: Sun starts changing into a red giant star, 3 times its present size. Earth is engulfed by the red giant Sun. +10000 my: Red giant Sun collapses and becomes a white dwarf. +20000 my: White dwarf Sun becomes a black dwarf. Age - An age is a unit of geological time shorter than an epoch, usually lasting several million years. Archean, Archaean - An eon of geologic time extending from about 4000 to 2500 million years ago. Derived from the Greek archaios meaning "ancient". The Archean eon is divided into four eras: Eoarchean, Paleoarchean, Mesoarchean, and Neoarchean. 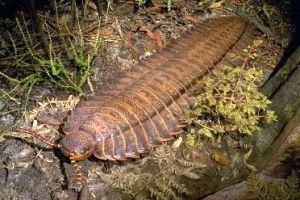 Cambrian - The first period of the Paleozoic Era, during which most modern animal phyla developed. The name derives from Medieval Latin Cambria "Wales". Cenozoic, Caenozoic, Cainozoic - The current geologic era, which began 65.5 million years ago and continues to the present. The word comes from the Greek kainos "new" + zoe "life". The Early Cretaceous Epoch had six Ages: Cenomanian, Turonian, Coniacian, Santonian, Campanian, and Maastrichtian. The Late Cretaceous Epoch had six Ages: Berriasian, Valanginian, Hauterivian, Barremian, Aptian, and Albian. Eocene Epoch - An epoch from 54.8 to 33.9 million years ago with four Ages: Ypresian, Lutetian, Bartonian, and Priabonian. Eon - A primary division of geologic time lasting over 500 million years, four of which have been defined: Hadean, Archean, Proterozoic, and Phanerozoic. Eons are divided into Eras, which are in turn divided into Periods, Epochs and Ages. Epoch - A division of geologic time lasting tens of millions of years. Epochs are subdivisions of geologic periods. Era - A division of geologic time of several hundred million years in duration. An era is smaller than an eon and longer than a period. Geologic Time Scale - A categorization of geological events based on successively smaller time spans: eons, eras, periods, epochs, and ages. Hadean - The earliest eon in the history of the Earth from the first accretion of planetary material until the DATE of the oldest known rocks. The name "Hadean" derives from the Greek Hades "Hell". Holocene - An epoch starting 11,400 years ago to today. From holo- "whole" + Greek kainos "new". The Early Jurassic Epoch has four Ages: Hettangian, Sinemurian, Pliensbachian, and Toarcian. The Middle Jurassic Epoch has four Ages: Aalenian, Bajocian, Bathonian, and Callovian. The Late Jurassic Epoch has three Ages: Oxfordian, Kimmeridgian, and Tithonian. Mesoproterozoic - an era with three periods: Calymmian, Ectasian, and Stenian. Mesozoic - An era of time during the Phanerozoic eon lasting from 251 million years ago to 65.5 million ago. Derived from the Greek mesos "middle" + zoe "life". Miocene Epoch - An epoch from 23.03 to 5.3 million years ago with six Ages: Aquitanian, Burgidalian, Langhian, Serravalian, Tortonian, and Messinaian. The name is derived from Greek meiōn "less" + kainos "new". Neogene - A period from 23.03 to today. This is the new name given to the time starting from the Miocene Epoch to today. Neoproterozoic - An era with three periods: Tonian, Cryogenian, and Ediacaran. Oligocene Epoch - An epoch from 33.9 to 23.03 million years ago with two Ages: Rupelian and Chattian. Derived from oligo- "few" + Greek kainos "new". Paleocene, Palaeocene Epoch - An epoch from 65.5 to 54.8 million years ago with three Ages: Danian, Selandian, and Thanetian. Paleogene - A period from 65.5 to 23.03 million years ago. This is the new name given to the first portion of the Tertiary Period. Paleoproterozoic - an era with four periods: Siderian, Rhyacian, Orosirian, and Statherian. Paleozoic, Palaeozoic - An era of geologic time lasting from 542 to 248 million years ago. Derived from the Greek palai "long ago, far back" + zoe "life". Period - A division of geologic time lasting tens of millions of years which shorter than an era and longer than an epoch. Phanerozoic - The most recent eon of geologic time beginning 542 million years ago and continuing to the present. Derived from the Greek phaneros "visible" + zoe "life". Pleistocene - An epoch from 2.58 mya to 11,400 years ago. Derived from Greek pleistos "most" + kainos "new". Pliocene - An epoch from 5.3 to 2.58 million years ago with two Ages: Zanclean and Piacenzian. Derived from Greek pleiōn "more" + kainos "new". Precambrian - Geologic time from the beginning of the earth to the beginning of the Cambrian Period of the Paleozoic Era. Proterozoic - The geologic eon lying between the Archean and Phanerozoic eons, beginning about 2500 and ending 542 million years ago. Derived from the Greek proteros "earlier" + zoe "life". The Proterozoic eon is divided into the Paleoproterozoic era, Mesoproterozoic era, and Neoproterozoic era. Quaternary - An informal sub-era from 2.58 or 1.8 mya to today. The Quaternary is traditionally associated with the Holocene and Pleistocene, but an alternative definition sets its start during the cycle of glacials and interglacials around 2.6 mya. Stage - A succession of rock strata laid down in a single age on the geologic timescale. Paleocene, Eocene, Oligocene, Miocene, and Pliocene. The Early Triassic Epoch has two Ages: Induan and Olenekian. The Middle Triassic Epoch has two Ages: Anisian and Ladinian. The Late Triassic Epoch has three Ages: Carnian, Norian, and Rhaetian. Intergovernmental Panel on Climate Change (IPCC) report, Climate Change 2001: The Scientific Basis. Scientific American, Vol. 295, No. 2, August 2006, p. 30. NASA, Recent Warming of Arctic may Affect Worldwide Climate, October 23, 2003. Overpeck, J.T., B.L. Otto-Bliesner, G.H. Miller, D.R. Muhs, R.B. Alley, and J.T. Kiehl. 2006. Paleoclimatic evidence for FUTURE ice-sheet instability and rapid sea-level rise. Science 311: 1747-1750. Robert A. Berner, Atmospheric oxygen over Phanerozoic time, Proc Natl Acad Sci U S A, 1999 Sep 28;96(20):10955-7. Cox, T. J.; Loeb, Abraham (2007). "The Collision Between The Milky Way And Andromeda". Monthly Notices of the Royal Astronomical Society 386: 461. doi:10.1111/j.1365-2966.2008.13048.x. arXiv:0705.1170. David P. Dobson and John P. Brodholt, Subducted banded iron formations as a source of ultralow-velocity zones at the core-mantle boundary Nature, 434, 371-374(17 March 2005). 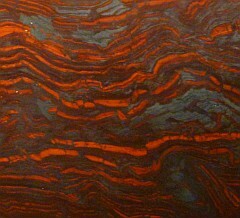 A 2.5-Gyr-old banded iron formation from Hamersley, Australia. GeoWhen Database. A compilation of international stratigraphic standards that tries to reconcile all of the various geologic time scales into a single self-consistent whole. International Chronostratigraphic Chart, The International COMMISSION on Stratigraphy sets global standards for the fundamental scale for expressing the history of the Earth. PALAEOS. 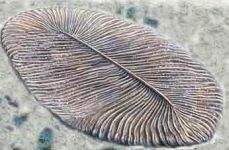 A collection of web pages on paleobiology, paleontology, evolution, and earth history. Sackmann, I. Juliana; Boothroyd, Arnold I.; Kraemer, Kathleen E. (1993). "Our Sun. III. Present and Future"
Zhonghui Liu, Mark Pagani, David Zinniker, Robert DeConto, Matthew Huber, Henk Brinkhuis, Sunita R. Shah, R. Mark Leckie, and Ann Pearson, Global Cooling During the Eocene-Oligocene Climate Transition,Science 27 February 2009: 1187-1190. Finlayson C, et al., Late survival of Neanderthals at the southernmost extreme of Europe, Nature, 2006 Oct 19;443(7113):850-3. EPUB 2006 Sep 13. S.J. Peale, Rotation histories of the natural satellites, in J.A. Burns, ed (1977). Planetary Satellites. Tucson: University of Arizona Press. pp. 87–112. Zahnle et al. (2007): Emergence of a Habitable Planet, Space Sci Rev (2007) 129: 35-78. Arbab I. Arbab, The Length of the Day: A Cosmological Perspective, Progress in Physics, 8,1, 2009. Yadong Sun, et al., Lethally Hot Temperatures During the Early Triassic Greenhouse, Science 19 October 2012: 366-370. Pagani, M., K. Caldeira, D. Archer and J.C. Zachos, An ancient carbon mystery. Science 314, 1556-1557, 2006. Goren-Inbar, N; Alperson, N; Kislev, ME; Simchoni, O; Melamed, Y; Ben-Nun, A; Werker, E. "Evidence of Hominin Control of Fire at Gesher Benot Ya'aqov, Israel". Science, 2004 Apr 30;304(5671):725-7. PMID 15118160.